I’m uploading this image here as an example of the magic of printmaking. 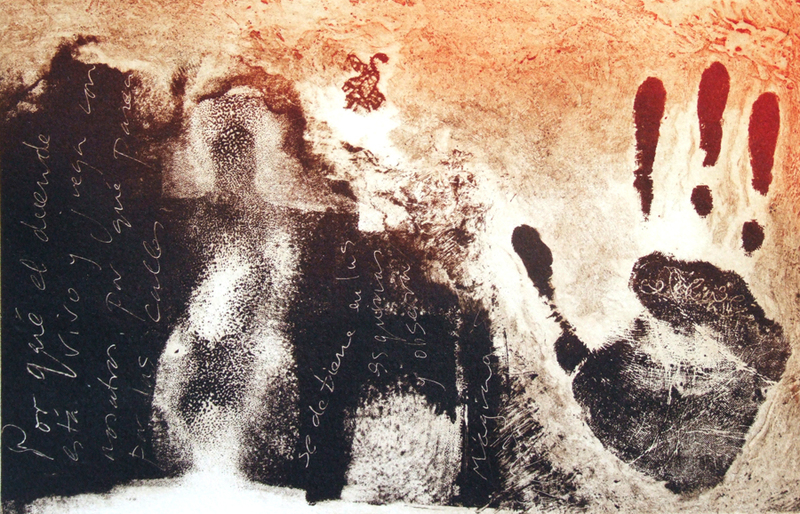 This solar-plate print called “El Duende” is based on a poem by Alejandro de Luna. It’s about the traditional creative muse that inspires Spanish artists and writers. He’s represented by that tiny figure in the white space near the top of the image, created from a scrap of 100-year-old lace. How did the figure of a woman appear at the left of the image? As far as I can tell it’s because I used an old roller which was slightly concave from years of use and it did not exert enough pressure on that part of the print. However it happened, it’s clear to me that the duende was working beside me.